3000 series aluminum sheet and 5000 series aluminum sheet are the common used series, with a wide range of application in our daily life.3000 series aluminum sheet belongs to aluminum-manganese alloy, it also know as anti-rust aluminum sheet, and 3 aluminum sheet and 3a21 aluminum sheet are the main alloy in 3000 series sheet. 5000 series aluminum sheet belongs to aluminum-magnesium alloy, 5052 aluminum sheet, 5083 aluminum sheet, 5754 aluminum sheet, etc. are the main alloys. Let’s see what difference that 5000 series aluminum sheet and 3000 series aluminum sheet have. 3000 series aluminum sheet has good rust-proof performance, good formability, high corrosion resistance and high strength. 3000 series aluminum sheet is widely used for the products that require high rust-proof and anti-corrosion performance, such as pipeline, power battery shell, air conditioning pipe, cans, television tower, etc. 5000 series aluminum sheet has high strength, high corrosion resistance, low density, good heat dissipation, strong pressure resistance, and it is easy to coating. 5000 series aluminum sheet can fully meets the requirements of 3C product, like highly integrated, lightweight, anti-fall, electromagnetic shielding and heat dissipation requirements. 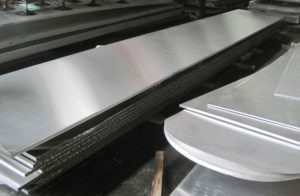 In addiction, 5000 series aluminum sheet is widely used for manufacturing Industry, such as ships, cars, radiators, etc.